study of the relationships of organisms to their physical environment and to one another. The study of an individual organism or a single species is termed autecology; the study of groups of organisms is called synecology. ..... Click the link for more information. ) are represented by the largely deciduous growths in Colorado, E Utah, and N New Mexico. A subclimax area extends from South Dakota to Texas and through part of the Great Basin. Among the chief species of plants in these regions are Gambel oak (Quercus utahensis), mountain mahogany (Cercocarpus parvifolius), squawbush (Rhus trilobata), western chokeberry (Prunus demissa), western serviceberry (Amelanchier alnifolia), and mesquite (Prosopis glandulosa). Evergreen shrubs are characteristic of the chaparral found in the southern half of California, especially near the coast, and extending into Nevada and Arizona. Among the dominant forms are several species of buckthorn (Ceanothus), manzanita (Arctostaphylos tomentosa and A. pungens), and the holly-leaved cherry (Prunus ilicifolia). A species of scrub oak (Quercus dumosa) is the chief deciduous form. Chaparral growth is sometimes so dense that it is almost impenetrable. Chaparral is one of the strongest antioxidants and blood purifiers known, used to kill viruses, bacteria, fungus, parasites, cysts, antitumor, and is a key cancer fighter. 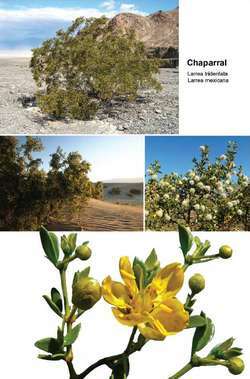 This hardy plant, comprising over 20 species, cannot only survive the extremes of scorching desert life, but can also live to be well over 10,000 years old. In fact, one of the oldest living plants on earth is a massive chaparral plant in California believed to be over 25,000 years old. Chaparral is also a great anti-inflammatory, and raises vitamin C levels in the adrenal glands. By strengthening the adrenals, inflammatory conditions are reduced in the body. Used for stress, immune function, virus, yeast, bacterial infections, venereal disease, stomach cramps, menstrual cramps, digestive aid, depression, blood sugar stabilized, allergies/asthma. Extremely strong blood purifier and hair growth agent because of high sulfur content. (meaning it smells and tastes bad) The antioxidants in chaparral include flavonoids, and a very powerful antioxidant known as nordihydroguaiaretic acid (NDGA). NDGA is such a strong and effective antioxidant that it was actually used for decades as an antioxidant preservative for oils and foods, with full approval of the USDA. Chaparral is best known for its ability to treat cancer effectively through multiple mechanisms. Since the majority of cancers have a microbial origin, the first mechanism is through the destruction of viruses, bacteria and fungi. Chronic inflammation has also been linked to the formation of cancers, meaning that chaparral’s antiinflammatory properties can inhibit some cancers. Cancers triggered, or aggravated by free radicals and toxins are confronted by Chaparrals antioxidant and cleansing properties. Chaparral’s liver cleansing properties makes it helpful for hormonal induced cancers since the liver is responsible for the breakdown of excess hormones. And finally, chaparral inhibits mitochondrial enzymes responsible for cellular division of cancer cells. Some people mentioned warty cysts flattening out within a week. Chaparral’s ability to kill microbes makes it useful against chlamydia, hepatitis, rheumatoid, infectious arthritis, multiple sclerosis (human herpes virus type 6), ulcerative colitis, Crohn’s disease, type 1 diabetes, pneumonia, bronchitis, herpes and venereal disease. Despite what others may claim, chaparral is one of the strongest antioxidants known, because it’s not limited to the water or lipid portions of the cell. The antioxidants in chaparral work in both parts of the cell. Chaparral is very resinous, and so is not easy to prepare as a tea. Resins and water do not mix, and the resin will separate out and stick to the pan wall when trying to make the tea. Therefore, it’s not recommended to use this herb as a tea. Its better to use the powder mixed with other herbs. The addition of other herbs can increase the effectiveness of each herb. For instance, chaparral combined with red clover blossom increases the anti-tumor activity of both herbs. Combining chaparral with pau d’ arco (lapacho, taheebo, ipe roxo) increases the antiviral, antibacterial, and anti-fungal activities of both herbs. Sulfur compounds in chaparral help to detoxify the body and strengthen the antiviral effects. Be aware this is a strong detoxifier, meaning many toxins could come out of the woodwork, resulting in skin eruptions, bad body odor , nausea etc. It’s good to do enemas and drink lots of water etc while detoxing. Do not consume the plant fresh, it contains super strong resins and alkaloids that are toxic to the liver, but if you let it dry for a couple of months, those alkaloids oxidize away ... so you take the leaves, dry them out a couple months, grind it up in a powder and then put them into capsules or simply mix the powder in water or juice and drink it. Chaparral is also called “Stinkweed” and those who have the powder know why. It has a very distinctive powerful smell and very bitter nasty taste- not very pleasant, so unless you like to tough it with water, it’s advisable to get some big “00” size empty capsules and fill them up with the powder so you won’t taste it. Remember to mix chaparral with Pau D Arco or andrographis or red clover for a more synergystic effect. Do not take if pregnant. Experiment with dosage, but many people take 5 capsules three times a day on empty stomach 30 minutes before meals for strongest effect. a thicket of primarily hard-leaved evergreen shrubs (mainly 1.5–2 m tall) distributed in the southwestern United States (California, Arizona) and in Mexico. Chaparral is analogous to the European maquis. Chaparral is usually found on shallow rocky soil on the lower slopes of mountain ranges. It gives way to forest higher up the slope and to prairie and semidesert lower down. Chaparral usually develops in places where forest fires have occurred. (Such vegetation appeared long before man learned the use of fire.) In California chaparral covers 4 million hectares. Chaparral is a plant community consisting of a large number of species, most commonly Adenostoma fasciculatum, four species of scrub oak, seven species of bearberry (Arctostaphylos), and five species of Ceanothus. Many of the plants are capable of forming root undergrowth after being reduced to ashes. Chaparral is sometimes used as pasture and is important in water retention. A vegetation formation characterized by woody plants of low stature, impenetrable because of tough, rigid, interlacing branches, which have simple, waxy, evergreen, thick leaves. greasewood, hediondilla, jarilla, larreastat) Germander Abnormal liver function or Banned in France and (Teucrium damage, often irreversible; Germany.